One Stunning Silk Dupion Cushion Pillow. Material -Silk Dupion ( Silk Blend). This Traditional styles of Dupion. Silk Cushion is from Banaras,India. Size- 16" x 16"(40 cm x 40 cm). The picture shown is a representation of the item. Nice handmade envelope style throw pillow accent pillow cover. It is easy on and off. Goes on a new pillow form or any pillow you have. Nice weight heavy cotton fabric. Machine washable. Pillow not included. Beautiful Indian Kantha Decorative pillow covers. Kantha Cushion Cover only. Insert not included. Handmade item. MODERNISM COLLECTION. BERLIN DIG 601 PILLOW COVER JACQUARD. 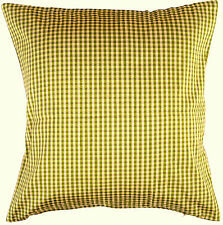 Jacquard woven, not printed Cushion cover NO FILLING. 5 Pcs Lot 100% Cotton Hand Block Print Decor Pillow Cover Cushion Throw. Item - 5 Pc Set Cushion cover. Reverse: plain color with concealed zipper along the border. Note: Cover only; Insert not included. MATERIAL : Cotton, Sari Patches. STYLE : patchwork cushion. Handmade throw pillow cover made of 100% Silk. It can go on any sofa/couch or can be used as throw pillow on bed or on floor. Extensive sequin and bead work!This is very picturesque antique hand crafted, embroidered Square pillow cover. MISSONI HOME GARDEN COLLECTION cushion with duck filling 16x16"
Pillow composition: top cover 100% cotton, bottom cover 100% polyester. Pillowcase with duck filled pillow. Item - 5 Pcs Set Hand Tie & Dye Shibori Cushion Cover. This is a Cotton Fabric Tie & Dye Shibori Design Cushion Cover. Just too beautiful hand dyed indigo cushion. The versatility of this gorgeous pillow is limitless. 5 Pcs Lot 100% Cotton Hand Block Print Decor Pillow Case Cover Cushion Throw. Item - 5 Pc Set Cushion cover. Reverse: plain color with concealed zipper along the border. Note: Cover only; Insert not included. This is a sale for one pillow. 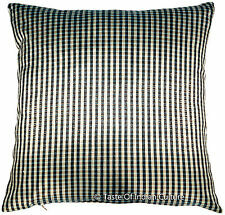 This is a lovely Dark Blue and ivory buffalo check in Country French colors. Great for your sun pourch or garden room, living room. The insert is down like quality and will last for years. This is a new handmade pillow cover. The fabric is Waverly Plaid Checks in Black, Brown and Beige stripes. I can send you a swatch if you need to see the fabric up close before buying. Pillow insert is not included in the sale. MISSONI HOME CUSHION COVER CACTUS GARDEN COLLECTION SUN MOLD PROF KOU 231 16x16"
They are stain proof and never get rotten. Washing machine : do not run the spin cycle. Just let the fabric dry in the air. Thespecial mass dyeing prevents the fading of the colors due to the sunlight, water and all the athmospheric agents in general. The Maasai shuka was traditionally worn by the Maasai community. It is still a popular item among the Maasai community and its beauty and versatility has been well received by the rest of Kenya and across the globe. 100% Cotton Hand Block Print Decor Pillow Case Cover Cushion Throw. Item - 5 Pc Set Cushion cover. Reverse: plain color with concealed zipper along the border. Note: Cover only; Insert not included. Give us a chance.